Another addition to our growing collection of natural stone items is this white Selenite Peak Point from Morocco. Looks wonderful on the L.E.D. Lightbox. Point is oblong in shape and is flat on the bottom. 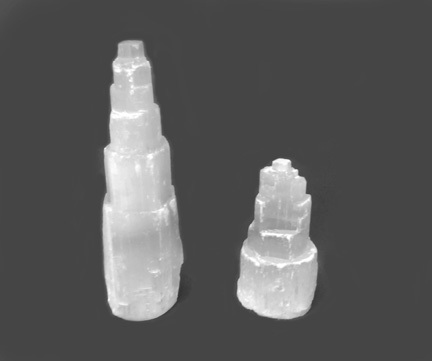 Selenite fibers are angled to a peak setting. Point is a little over 4" tall and around 2.5" across at the base at the price of $3.25 each. We also have a smaller version that runs about 3/4 to 1/2 the size for $2.25 each!